So you just picked up Destiny 2 and want to know how to power up for the raid as quickly as possible. Or maybe you’re stuck in the mid-200s and just don’t know what to do next. Don’t worry. We’re here to help. First, a quick explanation. There are two different forms of progression in Destiny 2. The first, levels, are simple enough: You’ll go from 1 to 20 just by shooting aliens and completing the main story. It’s the second form of progression, Power, that has the greatest impact on your character. Power (which you might also hear veteran Destiny players call “Light,” a remnant from game #1) is based on your equipment. The higher the numbers on your three weapons and your five main pieces of armor (helmet/gloves/chest/boots/class item), the higher your Power will be. Your first step is to play through Destiny 2's main story without worrying about any of this. (For general tips, see this post.) By the time you’re done, you should be around 200 Power, and that’s when the fun begins. You may have noticed that new weapons and armor will have Power levels based on your own level, often within a range of 3-5. So if you’re at 200, you’ll start finding gear at 201, 202, 203, and so forth. This is a trend that continues throughout the game, and there are different ways to take advantage of it. Some are more efficient than others. Do whatever you want! During these early levels, you’ll consistently find blue items that boost your Power, no matter what you do. Because this guide is dedicated to leveling quickly and efficiently, I will say that going from planet to planet and grinding public events is the absolute fastest way to go. You’ll get gear and planetary tokens, which you should save for now. That’s also the most boring route, so feel free to go do whatever. One thing you should definitely do is complete the planet quest on all four locations (EDZ, Nessus, Titan, and Io). That’s the blue flag you’ll see on your map. These planet quests are solid, will give you good loot, and most importantly, will eventually lead you to exotic weapon quests that will appear as weapons in your inventory. Hang onto those. You’ll also want to hang onto your milestones—the challenges you’ll see by holding L2 on the map screen—and anything else that rewards “Powerful” gear. Don’t turn that stuff in yet. You should also most definitely join a clan, which will help you get all sorts of rewards over the course of gameplay. What NOT to do: Turn in vendor tokens or Gunsmith materials, milestones, exotic weapon quests, Cayde’s treasure maps, Nightfalls, or anything else that drops “Powerful” gear. This is when you get to turn in all the sweet rewards you’ve been hoarding. Every “Powerful” reward can drop past 265, which makes those your best bets for getting past the vendor cap hump. 1) Milestones - these are the weekly challenges you can see by holding L2 on the map screen. They reset every Tuesday, and they’ll reward you with “Powerful” loot that goes past 265. 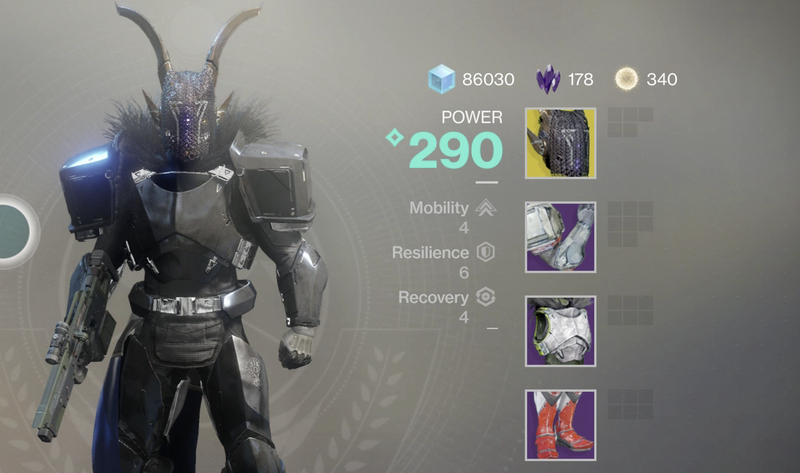 These rewards, like all the other loot in Destiny 2, will scale based on your current Power level, which is why you waited until 265 to get them—so they’re as high as possible when they drop. 2) Exotic weapons - You’ll get these at the end of each planetary quest, and they’re all multi-step journeys that ask you to do some silly, elaborate things. (The Rat King is particularly tough.) They’ll also drop all the way up to 300 Power, so they’re great ways to boost your level. 3) Nightfall - this is a superpowered version of a Strike. It changes every week and is challenging, but very rewarding. Be warned: There’s no matchmaking, so you’ll need to bring a couple friends along to finish this one. 4) Raid - Destiny 2's first raid opened on Wednesday, and it’s a great place to snag purple engrams and guaranteed gear, although, like the Nightfall, you’ll need to bring a group of friends to pull it off. 5) Cayde’s treasure maps - You can buy these from Cayde and track down chests in the wild that have totally random drops. They’ll range from absolutely nothing to 265+ gear. At this point, you’ll want to start thinking about infusing your gear once you find legendary or exotic weapons and armor that you really like. In short, this allows you to put a high-powered item into a less powerful item, changing the infused item’s Power level accordingly. So if you have a 265 legendary chestpiece that you love to death, you can infuse a 280 chestpiece into your baby and watch its Power grow to 280. You’ll also have to pay attention to mods, which can add +5 Power to an item’s base Power level. Read more about that system here. And that’s about it. Follow these tips and it won’t take too long before you’re ready for the raid, where Destiny 2 really shines. When you get there, just remember this important piece of advice: don’t die.